It’s never a boring spectacle when lava meets ocean waters, and when it happens the Hawaiian night sky, it’s even more awe-inspiring. We recently spoke with photographer Jack Fusco, who had traveled to the Big Island with his buddy Mark Jacobs, to capture his some of his most exciting and challenging footage to date. Fusco told us how the park had a roped off area to look at the lava from a safe distance, but that he constantly witnessed how people were trespassing. But a new video by Lava Ocean Tours, INC, captured by guest Russell Fry, reminds every trespasser that it’s – in Frusco’s words – “just not worth it” to pass the ropes. 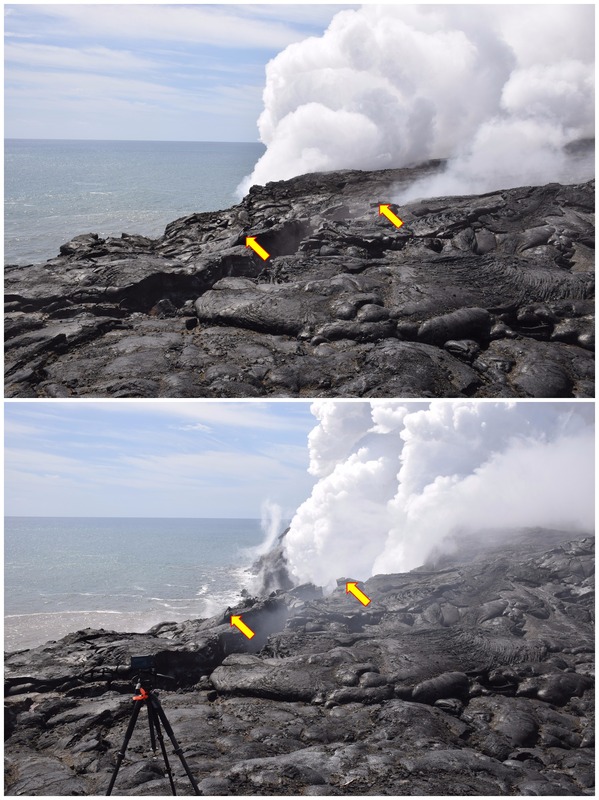 At any time, Mother Nature can decide to let a freshly made lava bench collapse into the sea. That’s not something any human being wants to be a part of. If you can watch it from a safe distance, however, it’s pretty spectacular. If we would have been on the same boat as Russell Fry and his boat companions, we would probably also be shouting out “oh sh*t!” and “oh my God!” A different perspective is visible on pictures from the Hawaiian Volcano Observatory. See that tripod? There’s no way the photographer was allowed that close to danger. So let that be a lesson. Always be weary of increasing instability! And listen to the park rangers – they’re there for a reason.